HBV polymerase (P) gene. Lamivudine-resistant amino acids have been described at position rt204 (rtM204V, rtM204I, or rtM204S) in the YMDD motif that encodes the catalytic center of the enzyme. [9,10] Another lamivu-dine-related mutation has been localized at position rt180 (rtL180M) and linked to the rtM204V or rtM204I changes. [11,12] More recently, mutations at positions rt173 (rtV173L) and rt207 (rtV207I), which had earlier been described as associated with famciclovir treatment, have been found in patients with lamivudine monotherapy and significant increase of serum HBV DNA load. Steric blockade between mutant amino acid side chains and lamivudine is the basis for the lamivudine-resistance phenotype as shown by molecular modeling studies using an HBV polymerase homology model. At position rt204, a steric conflict between the methyl group of isoleucine or valine and the sulfur atom in the oxathiolane ring of lamivudine accounts for the resistance observed on rtM204V/I mutations. 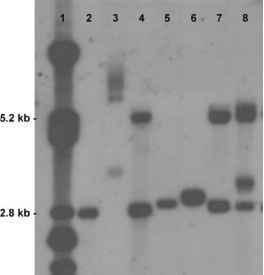 Lamivudine-resistant mutants have impaired replication capacity compared with the wild type. Nevertheless, the selection of lamivudine-resistant mutants is associated with reappearance or significant increase of serum HBV DNA and often leads to deterioration of liver function, which occasionally may be severe or even fatal.